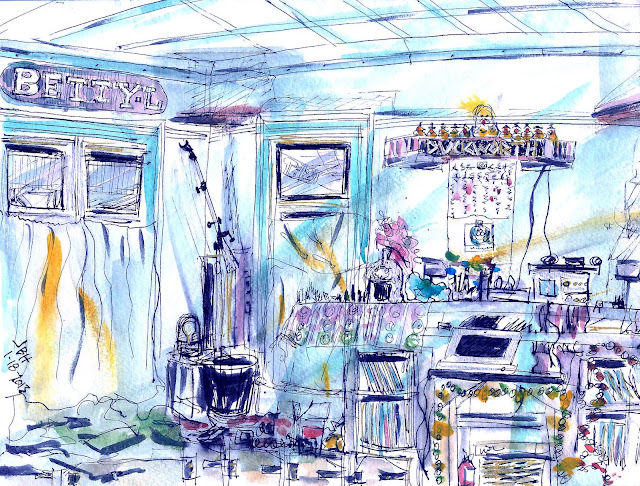 I sketched this of my friend Patrick's living room while he was packing for his Engineers without Borders trip to Nicaragua. The place, which is located in the Seattle central area and is otherwise known as the "Fraternal Urban Castle," has an always changing array of curious objects including rubber ducks, the nameplate from a boat he used to own, sound gadgets, light fixtures, and costume stuff. On this particular night, he also had piles of first aid stuff, tape measures, flashlights, a portable shovel, and objects I couldn't quite identify that were used for some or other sort of measurement or water purification or other task associated with his trip. I did this in about an hour or so and my biggest challenges were figuring out what I was drawing as I moved from object to object and capturing the complicated shadows that were cast psychedelically throughout the room. This is great *. * i want sketch as good as you *. * on my blog I too pulish my wokrs but they can't compare with yours. Wow, Jackie! This is great! You met those hefty challenges head-on!